This year marks the 150th anniversary of the children’s book Max und Moritz: Eine Bubengeschichte in sieben Streichen, which first appeared in print in October 1865. Wilhelm Busch’s now classic work relates in rhyming verse with accompanying illustrations the seven mischievous pranks of two young boys and their fateful demise. 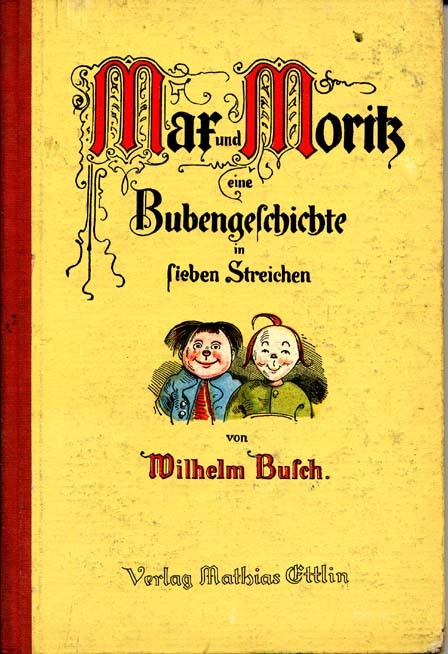 Busch authored several stories, but Max und Moritz was by far the most popular and successful. Even today, the work is well known in German-speaking countries and it holds a prominent place in the German cultural consciousness. On the occasion of the 150th anniversary of the book, here are 8 things you may not have known about this beloved children’s book. 1. 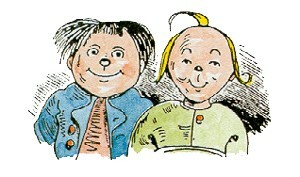 Max und Moritz was initially rejected for publication. The first publisher who was offered the manuscript, Heinrich Richter, declined to publish it because he felt it lacked sales potential. And what’s more: Busch was only trying to make amends for Richter’s publication of a previous work of his that was a flop. Busch had offered Richter the Max und Moritz manuscript without any expectation of payment. Richter was not interested. 2. Children were not Busch’s intended audience. Though often mentioned in the same breath as Struwwelpeter (1845), which Heinrich Hoffmann penned specifically for his son and later published, Max und Moritz was not originally meant to be a book for children. It was Busch’s publisher Kaspar Braun who suggested offering it through the children’s book division of his publishing house rather than in the pages of the satirical weekly, Fliegende Blätter, as Busch had suggested. Braun paid Busch 1000 guilders, the equivalent of about 2 years’ pay for a craftsman, for the rights to his manuscript. 3. Busch included autobiographical elements in Max und Moritz. Later in life, Wilhelm Busch himself reminisced that some of the things in his book really did happen. His friendship with the miller’s son Erich Bachmann and their childhood antics together likely inspired the figures of Max and Moritz. 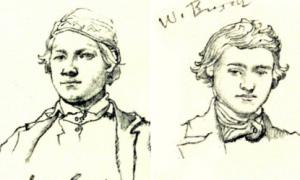 A pencil portrait that Bush drew at age 14 shows Bachmann as a young man with thick, round cheeks like those of Max. A self-portrait of Busch from around the same time shows a swirl of hair that suggests the perky jut of hair on Moritz. Busch and Bachmann hunted and caught birds with glue traps and ran around the Bachmann family mill covered in flour. As an adult, Busch visited his friend Bachmann at the mill. (Today that mill in the town of Ebergötzen has been turned into a museum and renamed the Wilhelm-Busch-Mühle.) There was also a tailor in town who did have to cross a small footbridge to get into his house, as the tailor in Max und Moritz does. And the family name Bolte — the name of the widow who appears in the first and second pranks — was common in Wiedensahl where Busch spent the first 9 years of his life. 4. Max und Moritz introduced something new to children’s literature. Children’s books first appeared in the later 18th century and were strongly moralizing and didactic. The books were meant to teach and instruct, not to entertain, and the child figures in those books behaved like pint-sized adults. Then in the first half of the 19th century, literature started depicting the child in what was believed to be his natural state – innocent and perfect. 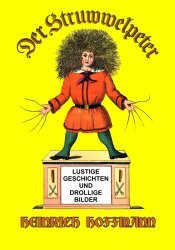 With their colorfully illustrated and entertaining rhymes, their wild and rebellious children, and their gruesome content, Struwwelpeter (1845) and Max und Moritz (1865) broke with both of these traditions. In both works, the drastic content in words and pictures was something new and unexpected. The characters in both stories behave badly and are punished for it. But Busch takes his representations even further than Hoffmann. Hoffmann’s work depicts typical child behaviors or missteps – thumb-sucking, fidgeting, playing with fire, teasing, not eating one’s dinner. 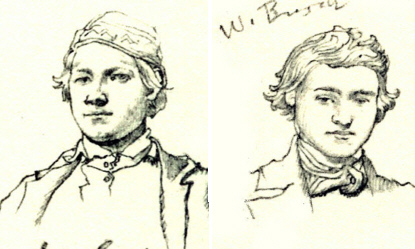 And his various characters suffer the natural consequences of their misbehaviors – Paulinchen burns herself to death, the animal torturer Friedrich is bitten by a dog, the Kaspar who won’t eat his dinner dies of starvation. By contrast, Busch’s children exhibit a natural maliciousness. They play a prank on the tailor, who nearly drowns because of it, fill their teacher’s pipe with gunpowder thus knocking him unconscious and singeing his hair and skin, and they steal pretzels from the baker. Max and Moritz happily get away with their pranks until the very end of the story where the adults exact their revenge. The baker slides the dough-covered boys into the oven to bake them. When that fails to end their mischief , the farmer catches the boys and delivers them to the miller, who grinds them into grain-size pieces. In the final picture, the reader witnesses the boys’ tiny remains being gobbled up by two ducks. Unlike the fates of the children in Hoffmann’s work, Max and Moritz’s demise is a result of the adults’ own violent acts. They intervene to end the incursion of the boys into their own sense of orderliness. Busch was writing 20 years later than Hoffmann. Many authors of his day were striving to depict the reality of everyday life and casting light on the conflict between the individual and society. In Max und Moritz, the boys are punished because they violate established behavioral norms and because they disturb the orderly routines of the adults. Busch demonstrates that the narrow-minded middle-class society of his time has no place for children like these. The only option is their removal from from the social order and this is carried out quite consciously and efficiently – and brutally – by the adults in their world. Though the final act of the adults is even more gruesome and sadistic than any of the things Max and Moritz perpetuate, it is greeted by the community with quiet contentment — “Als man dies im Dorf erfuhr, / War von Trauer keine Spur” – and even approbation: “’Gott sei Dank! Nun ist’s vorbei / Mit der Übeltäterei.” Busch exposes the coldness and harshness of an authoritarian society and unmasks the moral hypocrisy inherent in the violent removal of those who violate their sense of order. 5. For decades, educators were critical of Max und Moritz. Nineteenth-century educators watched in dismay as Busch’s work grew in popularity. In 1883, Friedrich Seidel called the caricatures in Max und Moritz and other of Busch’s works “gefährliche Gifte” (dangerous poisons) that were making contemporary youth insubordinate, impudent, and flippant. Another critic disliked that the wanton mischief of the boys went unpunished in episode after episode, and that the final punishment was then an exaggerated and unrealistic event that inspired laughter instead of fear and learning. Not only the verses were objectionable; the pictures alone were enough to make the book in appropriate. The caricaturized adults are made the object of ridicule. Julius Dococ was certain that children would love the book, which made it all that much more dangerous. Even in 1929, school officials in Steiermark forbade the sale of the book to kids under 18. 6. Max und Moritz changed Busch’s fortune. Max und Moritz was popular beyond Wilhelm Busch’s wildest dreams. Published in 1865, in 1866 it was translated into Danish, and the following year an English edition appeared. Japanese and Hebrew translations followed. By the time Busch died in 1908, the book was in its 56th edition, had been translated into 10 languages, and had sold more than 430,000 copies. It has since been translated into over 150 languages and dialects. The publication of Max und Moritz changed Busch’s fortune. His writing career had begun modestly. But by the time of his death, he was well off and well known. Today he is considered one of the most influential humoristic authors and illustrators in Germany and is known internationally. Even Maurice Sendak, author of the wildly popular children’s book Where the Wild Things Are, among others, said that he stole something from Max und Moritz for nearly every one of his books. 7. Max und Moritz is considered the forerunner of the comic strip. Max und Moritz served as an early model and inspiration for the American newspaper comic strip. In 1897, Rudolph Dirks created a comic strip for the newspapers of William Randolph Hearst based on Max und Moritz. “The Katzenjammer Kids” became the first fully developed cartoon strip in the U.S., featuring speech balloons and a continuous cast of characters, with the action divided into small, regular panels. 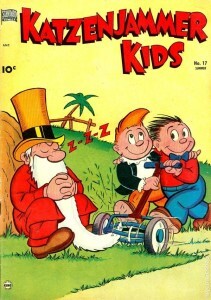 Figures Hans and Fritz are easily recognizable as descendents of Busch’s two protagonists and even some of the key scenes in Dirks’ work are identical to Busch’s. Wilhelm Busch is frequently called the forefather of modern comics. 8. Max und Moritz still has a significant place in the German cultural consciousness. References to Max und Moritz have been and still are everywhere in German-speaking areas, sometimes even in the most unusual and unlikely places. The book title has shared its name with schools (! ), restaurants, taverns, and golf tournaments. The boys’ names and image have appeared on packages of sauerkraut, sausage, and cheese, on postage stamps, telephone cards, and objects for every day usage, such as key chains, T-shirts, lunch boxes, mugs, nightlights. They have been the inspiration for toys and new card and board games. There have been parodies and imitations of the work, it has inspired new comics and cartoons, recordings, and dramatizations, and adaptations have been produced for film and musical and theatrical performances. And the Max-und-Moritz-Prize is awarded biennially for the best German comic artist, as well as the best German and international comics and comic strips, the best children’s comic, and the best student publication. In addition, the judges award special prizes and a lifetime achievement award. The ubiquity of Max und Moritz in German-speaking regions shows its continuing place in German cultural identity even 150 years after its publication. Want to read Max und Moritz? Here is an online version of the story divided into sections. And here is the audio for the story as a QuickTime video with pictures from the book. If you are intersted in the history of the book, this digitized version of the original 1865 edition might interest you. Or maybe you’d like your own downloadable copy. This is a free copy in pdf-format. 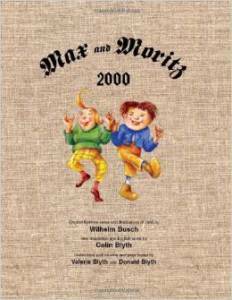 If you to have your own copy of Max und Moritz, you can find a German-English dual language edition on amazon.com or a German one on amazon.de. Had both of these books when I was a little girl, my favorites. Have a collection which I use in my German Culture class. Kids are horrified at the pranks! OMG lol! It was my most favorite children’s tale and my Oma had to read this tale to me every night. At age 5 I moved to United States and have thought of my childhood fairy tales often. Why I never shared this tale with my young children, i don’t know, it didn’t make me for any worse; however, just recently watched the video audio of Max and Moritz with them as they are now 25 and 23 years of age! Both that it was bad and both said they will not be showing it to their young children. However both of my children were impressed by the cultural side associated with the tale and it’s timeless history still living on today. Vielen Dank! I love this about Herr Busch & his childhood friend & townspeople! I have another old very interesting illustrated book by W.Busch from my mum’s library. (Of folktales he translated from various sources — it looks like). She was a DP brought to the States after WWII by the Red Cross… from Berlin then Frankfurt. Remarkably she & then her parents/my grandparents brought some of their books etc. to the States — despite the bombing & displacement. As children we had Max und Moritz & also Struwwelpeter. I LOVED them & since gave our family copies to my niece & bought myself new copies. I stopped sucking my thumb due to the scary Tailor Man (Scissor Man) who my grandmother & mother would jokingly remind me would cut off my thumbs if I sucked them. I really believed he was real! I’m sure they did not realise that when they told me this more than once — but it worked better than the admonition that my teeth would be ruined. Every time I meet another ethnic German from anywhere in the world — they always ask me if I too grew up w/ these books! It seems to be one of the things we all have in common — so it makes me sad that people are no longer passing them on to their children as much as in previous years. This seems to be true of all of the “classic” children’s stories. Many of my students nowadays are — sadly — not familiar with many of the fairy tales I grew up with. Famous story in Denmark. I habe Deutsch in der Schedule gelernt.